Amenities: Roof-top sun deck & barbecue area, gym. West: Looking into the Atria condos building. Some of the upper floors will have views over Atria. North: Looking at an apartment building across the street. Some upper floors will over it towards Horton Plaza mall. North facing Atria condos are on Market street, which is a busy street. East: Looking into another apartment building. South: No views, looking into adjacent buildings. Almost all units face another direction. Note: These views may change in the future or if your on a very low floor may not have any view. Each buyer should verify on their own. Like the most: Residents have conveyed to me that what they like most is the location. 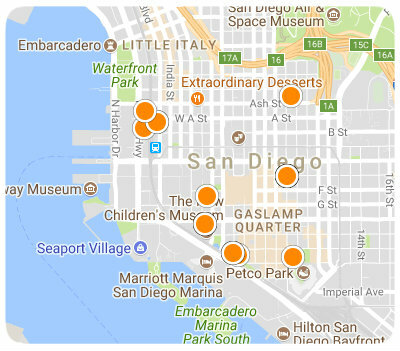 Very centrally located, close to the Gaslamp, the mall and the main grocery store. Like the least: Some residents feel the units are too small and are disappointed there is no guest parking. Other comments: Seems to be a large turnover in tenants. Very comfortable and homely. Great development with not too many floors as with high-rise buildings. Great value in acquisition cost and HOA fees.